Genesis chapter 1 needs no introduction. I am currently attempting to construct an interpretation of this immensely important passage, which has ever been a difficult and controversial endeavor. A standard practice when we run into such difficulty is to look to other parts of the Bible which could clarify our passage: we apply adages such as 'Scripture interprets Scripture', 'New Testament interprets Old Testament', and 'clear passages interpret vague passages'. Ideally, this other passage used to interpret Genesis 1 would be an easily interpreted New Testament text that clearly references the Genesis creation story. This ideal passage actually exists: it is John 1. The parallels between John 1 and Genesis 1 are impossible to miss. They begin with the same words, invoke the same themes (creation, light, life), and as we'll see, employ the same stylistic structure. The authorial intent in John 1 to parallel Genesis 1 is so clear that John 1 should be, by all rights, the primary passage through which we interpret Genesis 1. It is arguably the longest passage outside Genesis itself which talks about the creation event, and is one of the very few passages in the entire Bible which can match the gravitas of Genesis 1. If we believe in the unity of the Scriptures, we must interpret Genesis 1 in light of John 1. And yet, I have seen virtually no attempts to interpret Genesis 1 this way. I do not know why. This is all the more surprising in light of other verses, such as Exodus 20:11, which I have seen applied to interpret Genesis 1. Compared to Exodus 20:11, John 1 is longer, addresses the topic of creation more directly, and parallels the style and structure of Genesis 1 more closely, yet in my experience, it is referenced less often. 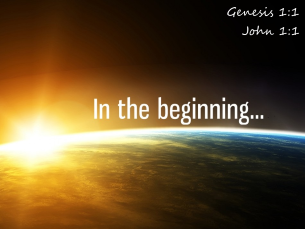 So, what features of John 1 are particularly relevant to Genesis 1? First, note that John 1 begins with a series of highly abstract, symbolic statements. They are fortunately easy to interpret, since we know that they all refer to Jesus. None of the statements in the first part of this chapter are to be taken literally. John 1 begins with "In the beginning was the Word, and the Word was with God, and the Word was God". Here we understand that there weren't a bunch of letters somehow floating around God. Even interpreting "Word" as "reason" or "logic" falls short of the true meaning which can only be accessed symbolically. The same goes with verse 4 and 5: "In him was life, and the life was the light of all men. The light shines in the darkness, and the darkness has not overcome it". Christ is not literally light (he is not a bunch of photons) or literally life (he is not the abstract concept of "life"), but these are things that represent him. John 1 continues in this abstract, symbolic fashion for the first 18 verses. It does make some firm statements which could be said to be "literally" true, such as verses 12-13, or verse 6 where it mentions John the Baptist by name. But even these statements are highly conceptual and very general in scope, and the abstract symbolism of the first few verses are thoroughly mixed in with them. Furthermore, John 1 doesn't even mention Jesus by name until verse 17, and even that passage begins with this well-known mix of abstractions, poetic symbolism, and concrete reality: "And the Word became flesh and dwelt among us..."
In fact, the nature of the topic in the first part of John 1 is so abstract, conceptual, and symbolic that the passage cannot be read literally. It would become absurd if you tried. "The Word became flesh" would then mean something like "the letters turned into sausages" in this ridiculous sense. This is a limitation of human language: we do not have a separate way of talking about nonphysical things other than to employ literal language metaphorically. We have no other option if the topic itself is not purely physical, and this metaphorical reading is not automatically inferior to a literal reading simply because it's metaphorical. After this abstract start, the writing style finally settles down in verse 19, and the down-to-earth narrative begins. The change is actually very abrupt. After 18 verses of highly conceptual words like "the beginning", "Word", "God", "light", "life", "glory", "grace", and "truth", verse 19 says, "And this is the testimony of John, when the Jews sent priests and Levites from Jerusalem to ask him, 'Who are you?'" In a single verse, we have a specific people group (Jews), occupation (priests and Levites), city (Jerusalem), and the start of a simple dialog, which are all to be interpreted literally. After this sudden transition from "abstract" to "concrete", the story continues on in this comparatively mundane, literal fashion for much of the rest of the book. This sudden change in style, and the corresponding change from an abstract to a concrete topic, strongly suggests that the first 18 verses of John are something like a prologue. This is not surprising - after all, prologues are a common literary tool. How does this interpretation of John 1 - which is quite certain and noncontroversial - carry over into Genesis 1? Extremely well. We're using John 1 as a key to unlock Genesis 1, and it turns out to be a perfect fit. John 1:1-18 is the prologue to the gospel story, and it introduces Jesus as God's incarnate Word. Genesis 1:1-2:3 is the prologue to the whole Bible, and it introduces God as the Creator of the world. Like in John, the Genesis prologue - which consists of the seven days of creation - is abstract and symbolic, and is not meant to be taken literally. Although the symbols are not as obvious as in John 1, two things stand out as pretty clear metaphors: the light that God created on the first day, and God's rest on the seventh day. For how could you ignore the profound meaning that "light" has as a metaphor, and only interpret it as some photons zipping around in space? And what could it even mean that God "literally" rested? Also like in John, the statements made in this prologue are very broad and non-specific, especially compared to the text that comes right afterwards. Note, for example, that the humans are not named as Adam and Eve in chapter 1: they are only said to be made male and female. No animals, no plants, no places, not even the sun and the moon are specifically named. This, combined with the poetic repetition of many phrases over the days of creation, give the whole story that abstract, conceptual feeling, standing apart from the concrete, detailed, mundane world that we experience. Contrast that with the passage that immediately follows this prologue - the so-called "second account of creation" that starts on Genesis 2:4. Like in the book of John, there is a dramatic, instantaneous change in the style and the level of detail of the story. The style settles down from the poetic and all-encompassing first chapter, and there are numerous mundane details sprinkled into the story. The text mentions specific rivers, trees, and places, and even points out where to find gold and gemstones. Just this change would be good evidence that the creation week should be interpreted differently than the remainder of Genesis. But additionally, consider that the exact same change happens in John, and it becomes very clear that the prologues in Genesis 1 and John 1 are parallel passages that should be interpreted in the same manner - metaphorically. So it's best to look at Genesis 1:1-2:3 as a kind of prologue. Let's examine some other well-known prologues, to see that Genesis 1:1-2:3 does in fact belong to this class of writing, and to better understand how to interpret it. The book then starts the actual narrative after this prologue, dropping the broad, abstract generalizations and providing many more details. It gets down to the business of establishing the setting and introducing characters and so forth. Also noteworthy is the poetic use of repetition to set itself apart from the rest of the book, alerting the readers that it should be interpreted differently than the text that follows. All of these are features found in the Genesis creation story, and nearly all of them are also found in John 1. Again, note the paucity of details, the poetic structure, and the broad, general language. Other than the single mention of "Verona", this story could be set anywhere. Note also that different rules of interpretation apply here: the main script would rarely break the fourth wall this explicitly and acknowledgement that this is a play. Of course, after this prologue, the abstract generalizations are dropped, and the details are filled in. The features here should be familiar by now: the scarcity of details, the broad, sweeping language, the sudden change in style and language structures that sets it apart from the remaining text, and the corresponding need for a different interpretive lens. Lastly, the tendency for prologues to be more poetic than the remaining text is displayed well here - even though the U.S. Constitution is a legal document, the founders could not help but add small literary flourishes to the preamble, such as "a more perfect Union" and "the Blessings of Liberty to ourselves and our Posterity". The same tendency can even be seen in some science textbooks, which occasionally wax poetic in a "prologue" about science, nature, and truth before it actually gets to teaching you specific things. So, what have we learned by looking at these well-known prologues? Several things: prologues are set apart from the remaining text by a markedly different style and structure. They do not give specific details, but make broad, general statements instead. They are more abstract, metaphorical, and poetic than the remaining text. And lastly, all this requires prologues to be read differently, through a more metaphorical, abstract interpretive lens. All of this applies to the creation week in Genesis 1:1-2:3, which perfectly conforms to these patterns that are well established by other famous prologues. But most importantly, these same patterns are also found in John 1, which is the most relevant passage in the Bible for interpreting the Genesis creation story. The explicit parallels between Genesis and John leave no room for ignoring John when we interpret Genesis. The unity of Scripture requires that we interpret these two passage in the same way - and John 1 clearly employs metaphor and symbolism to express highly abstract ideas in a broad, sweeping prologue to the rest of the book. We therefore conclude that both Genesis and John begin with a prologue, which is more abstract, poetic, and metaphorical than text that comes afterwards. This means that we should not interpret the "days" in the creation week as literal 24-hour periods. Furthermore, we should not attempt to extract specific scientific facts or chronology from the seven days of creation, as prologues intentionally leave out details to make broad, "big picture" statements instead. What, then, is the actual meaning of Genesis 1, if it's not meant to be read literally? That will be the topic of a post in a few more weeks. But meanwhile, the next week will examine the use of the word "light" in Genesis 1, in relation to how it's used in the rest of the Bible. An interesting set of comparisons. But let's take a step back here. Whenever you look at a passage, you can interpret it as literal, or you can interpret it as metaphorical. As this is Scripture, it must by definition be validly interpretable in one of those ways; we're trying to find which is the more appropriate interpretation. You're drawing the point here that it is valid to interpret Genesis 1 metaphorically. So far, so good. However, the parallels you draw do not preclude its interpretation literally; I could take any clearly literal passage, and find literary similarities with something fictional that 'proves' that the passage is metaphorical. There is room for a metaphorical interpretation, based solely on John 1 as a reference passage. But just finding that two points are in agreement with your conclusion doesn't prove that the conclusion's right - the old joke about proving that all odd numbers are prime comes to mind. (http://rationalwiki.org/wiki/Fun:Proof_that_all_odd_numbers_are_prime if you haven't seen it.) Contrary data points are, in effect, stronger than supporting ones; I could go out researching the theory that all sheep are black, and I could find thousands of supporting instances, but as soon as I find a non-black sheep (preferably also a non-artifact sheep, so it can be targeted with Terror - but I digress), my statement has to be modified to cope with it. So if Ex 20 is declaring a rule of Sabbath rests on the basis of simple 86400-second days, and it gives as its justification a parallel to the days of God's work of creation, that should be strong evidence that the "days" described in Genesis 1 were either strictly literal, or at least something comparable - not just narrative style. I wouldn't say, for instance, "Since Gilbert & Sullivan's 'Iolanthe' has 25 separate musical numbers, it's critical to have 25 ladies in the chorus", because the song divisions are pure narrative style. But God does say that we should rest every seventh day, on the grounds that that's what He did. So to what extent could those days not be exactly 24 hours long each? Well, relativity says that 24 hours as observed here might be a quite different length of time as observed somewhere else; Dr Humphreys, in his book "Starlight and Time", posits the theory that (if I'm not misunderstanding him here) God created a white hole with this planet at its center, and that the days of creation were as they would be observed from here, and meanwhile God is 'stretching out the heavens' (moving stars etc into their positions) and having light begin travelling from them. There are other possibilities, too, but I would strongly state that they must be something strictly descriptive. And personally, I believe that they're strict days, because that causes the least conflicts with other known facts; but I'm fully aware that that's only my interpretation, and is not itself a provable fact. I think that, if all I had was something like "look at all these other pieces of writing that looks like Genesis 1, and they're all metaphors! ", then my case would be weak. But one of these pieces of writing is John 1, which is absolutely crucial in that it's deliberately written to parallel Genesis. It's not just comparing one random piece of writing to another, it's like comparing a book with the movie of the book. On these other verses such as Exodus 20, I'll cover them in another post, but I acknowledge that for the time being, they do count as evidence that the days should be interpreted literally. Now, I don't think this is nearly enough evidence to be conclusive or even all that significant, but it does fall on that side. And one of the reasons that I can respect my opposition on this question of interpreting Genesis is that they are not entirely without Biblical evidence to support their question. I'm generally unimpressed with scientific attempts to reconcile Genesis with a young earth, however. There's just too many lines of thinking that all point to the earth being billions of years old. For example, an attempt like the one you mentioned, fanciful as it may be, might account for astronomy showing that the universe is ancient. But it doesn't help at all against geological or genetic evidence of an old earth. And from a scientific point of view, this unity in narrative from multiple fields that all agree on an old earth cannot be undermined without some very drastic changes, larger than any we have seen so far in the history of science. There actually isn't all that much geological evidence for an old earth. If once you accept that the Noahic flood was global (which IMO is a perfectly straight-forward and reasonable interpretation of the passage), then you immediately have a huge catastrophe that can lay down large amounts of mud across the world, which is actually much more likely to result in fossilization than a slow process is. There's no decay prior to burial, because the time between death and burial is almost none (or in some cases negative - a lot of creatures would have been buried alive by mud, sealed in place, and killed by that mud). The evidence we see is consistent with a few millennia of time plus a whopping great upheaval, and in some cases is quite a bit more consistent with that than it is with billions of years of slow processes.